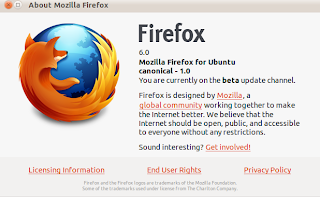 Finally Mozilla Firefox team has Officially release Firefox 6 Final trough this announcement and has been putted in mozillateam PPA, for those ubuntu user who have not tried yet, can Install/Upgrade to Firefox 6 through this way. Mozilla Firefox 6 final also available for download via Mozilla Firefox FTP, which usually released ahead it's official release. Now Firefox 6 Final has available in ubuntu 11.04 default repository, go to terminal then type apt-get upgrade firefox. (you do not need to use PPA repository to install/upgrade Firefox 6 in ubuntu).